A Christmas decoration is any of several types of decorations used at Christmastime. 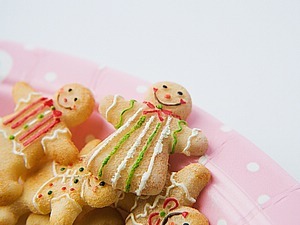 The traditional colours of Christmas are pine green (evergreen), snow white, and heart red. Blue and white are often used to represent winter, or sometimes Hanukkah, which occurs around the same time. Gold and silver are also very common, as are just about any other metallic colour. Typical icons of the holiday include Santa Claus, Baby Jesus, and the star of Bethlehem. Typical winter icons include snowflakes, snowmen, icicles, and even penguins and polar bear. The Christmas tree is often explained as a Christianization of pagan tradition and ritual surrounding the winter solstice, which included the use of evergreen boughs, and an adaptation of pagan tree worship. The English-language phrase "Christmas tree" is first recorded in 1835 and represents an importation from the German language. The modern Christmas tree tradition is believed to have begun in Germany in the 18th century though many argue that Martin Luther began the tradition in the 16th century. From Germany the custom was introduced to England, first via Queen Charlotte, wife of George III, and then more successfully by Prince Albert during the early reign of Queen Victoria. The influential 1840's image of the Queen's decorated evergreen was republished in the U.S, and as the first widely circulated picture of a decorated Christmas tree in America, the custom there spread. Christmas trees may be decorated with lights and ornaments.